After several years of trying to adopt domestically, God led us to pursue international adoption. 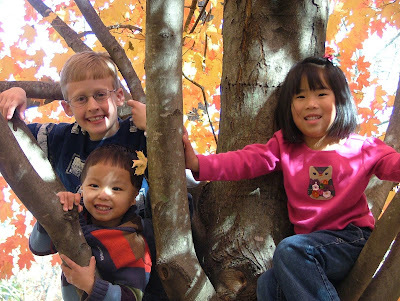 In October of 2005, our family traveled to China to adopt our daughter, Rylee. Our oldest son, my husband, and myself soaked up the experience, yet counted down the days until we would return home. There were several times when we said, “We’re glad we came, but we are glad we don’t have to do this again” as it was a long, emotional, and difficult trip for us. How could we argue with that? One-by-one God changed each of our hearts and by June 2006 we were working on another stack of paperwork. Our paperwork was sent in a week after Rylee’s first anniversary with us. In late June of 2007, after waiting many months and watching the “Special Delivery” listings on our agencies website, a little boy caught my eye. I believe that this particular list had been up since May. I had poured over this same list several times before, but I had not seen this little boy until that moment – Isn’t God’s timing always amazingly perfect? This little 18-month-old boy, listed as Stephen on the “Special Delivery” list, had been on the list awhile and yet no one had inquired about him. He had been diagnosed with bilateral microtia/atresia. We were drawn to him, but not quite sure that this was a match for our family. A week later, my sister-in-law and her family came for a visit. Knowing that my sister-in-law’s friend had adopted a little boy with an ear condition six months prior, I showed her the picture of Stephen. She proceeded to tell me that this was the same condition that her friend’s son had and she shared how he was thriving in his new home. A condition that we had never heard of and the timing of her visit perked our interest and we began doing some preliminary research on the condition and contacted her friend. Through many miraculous events, the answer became abundantly clear that we were being called to adopt this little boy. So, we submitted the necessary paperwork to begin the process of adopting him. In the midst of submitting our paperwork, we requested additional information from China. We requested an ABR (auditory brain response test) and agreed to pay the additional fees to have this test conducted. China agreed and drove a significant distance to meet this request. After receiving the results, we submitted all of the medical records to our international adoption pediatrician for review. 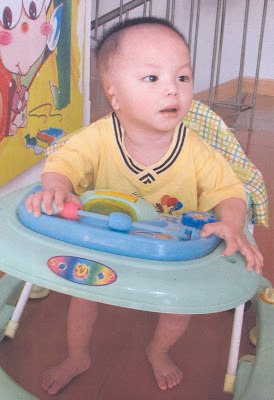 We believed with all our hearts that God was leading us to adopt this little boy. So, we began praying that if this was not His will that He would clearly close this door in a way that we could be certain. On Saturday, July 14th we received the call from our pediatrician. She indicated that she had significant concerns for the health of the child. He was born on the normal bell curve for Chinese boys, but had since then slipped off and was very tiny for his age. She indicated that this had to mean 1 of 2 things: He was either severely malnourished or there was something seriously wrong internally. If he was receiving the appropriate nutrition and calories, then something was wrong internally whereby his body was not absorbing them. Either way, she had significant concerns as we had two other young children to care for. That night, based upon what we believed was an answer to our prayers; we elected to terminate the process. We felt as though God had answered our prayers – Not in the way that we wanted, but the answer was clear. Tearfully, we posted a note on our blog to family and friends who had prayed with us through this process telling them it was over. Several days later, my husband was cleaning off his desk at work. While doing so, he came across the health records that had been reviewed the previous week. Since the process was over he decided to shred them. After shredding approximately ½ of them, he looked down at one of the pages just prior to shredding the remaining pages. His eyes were drawn to the date on one of the documents – God was revealing to him that there was a mistake in the dates. After frantically rereading the remaining pages, it became clear that there was a misprint in the documents. Two of the 13 pages had a February 16, 2007 date on them. All of the remaining pages had a February 16, 2006 date. Frantically, he attempted to call me. Once he was finally able to get me, he said “I know this sounds crazy and I hate to do this to you, but I need you to pull out the medical paperwork again. I believe with all my heart there’s a mistake in it”. After pulling out the information from our computer’s recycle bin, I had to agree with him that there were errors. Of course, it all happened a few minutes before 5:00 and my rush to contact our social worker was put to a halt as no one was answering the phones. So, we were forced to wait until the next morning to investigate our theory. The next day, our social worker looked over the documents and was just as puzzled. She assured us that she would have the staff that translated the documents look over everything again. Since there is a 12-hour delay and the offices in China are closed, we were forced to wait even longer. to do the same? So, literally days before his file was to be returned to China, we scurried to finalize the paperwork necessary to make a request to the Chinese government that he become a part of our family! He arrived home to us on December 19, 2007 and captured our hearts. Having a degree in deaf education, I quickly began using sign language as he transitioned into our home. He responded immediately to our mode of communication and quickly caught on to the English language. Stephen, now Ryan, is a thriving 3½ year old that loves cars and the outdoors. He has adapted very well and is very healthy. He has a wonderful, confident, and curious personality. He already has a sense of humor and can make you laugh within minutes of meeting him. We know without a doubt that God is going to do great things in and with his life!! He wears a BAHA (bone anchored hearing aid) on a softband and with this device he has hearing within “normal” ranges. He is receiving services through our county school system. While in school, he also utilizes an FM system that has been very beneficial for him with the background noise within the classroom. We have learned to “never say never” and now feel complete as a family of five! We could not imagine our family without him! Believe it or not, I left out a TON of details from his story. If you are interested in reading the whole story, the journey to China to bring him home, the quest to provide him medical support, etc, feel free to check out his blog here. We are happy to answer any questions you may have about this condition or adoption in general.